The Echinococcosis Hydatid Cyst originator - an echinococcus (echinococcus granulosus), a small flat worm-tsestoda in length from 2 to 5,5 mm. The helminth consists of a head - a scolex or a body supplied with four muscular suckers and double series a hook, a neck, and three-five segments of a body of a parasite. First two segments - sexless, the third member is hermaphroditic it, i.e., contains mens and female sexual systems. Last, 4th - a mature segment, the biggest, can contain on the average 400-600 eggs of a helminth. Egg of an echinococcus in the size 0,035x0,03 mm represents a special protective cover in which is, so-called oncosphere, supplied with six hooks. In further, after infection, from this oncosphere the larva or, in other words, a germ of a worm of an echinococcus develops. The life of this helminth shares on 2 parts - larval (germinal) and mature. Accordingly, the echinococcus has two owners - intermediate and definitive. As definitive owners, carnivores serve basically various diverse representatives of the family of hound - a dog, a wolf, a jackal, a fox, a hyena etc. slightly more rare definitive owners others can carnivorous, for example - cats, or omnivorous - pigs. In an intestine, is more exact in a small bowel of definitive or basic owners and the puberal individual of a helminth parasitizes. Intermediate owners of a parasite can be more than 60 kinds of mammals. Almost all agricultural animals here concern: sheep, cows, horses, camels and others herbivorous, and also omnivorous - pigs. Intermediate carriers can be and wild animals: deer, elks, various rodents. Unfortunately, the intermediate owner for an echinococcus can be and the humans. Infection of the humans hydatidosis (also named Hydatid Cyst or echinococcal disease) occurs at contact to dogs and cats more often. It it is no wonder - after all these animals are closest to the humans. Dogs or cats are infected, eating up meat (mainly a liver and lungs) inseminated by echinococcus scolexes. Infection of dogs also is possible at eating of the hunting trophies by them, the affected organs or corpses of wild animals. In an intestine of the infected dog scolexes in 2-3 months get the tenial form and become puberal. Such helminths live in an organism of a dog of 10-12 months. The ripened segments, containing echinococcus eggs, possess ability independently to move. Out of an organism of the owner they can move on distance to 30 sm, scattering around the contents. Dogs infect environment (apartments, court yard, parks, pastures...) The excrements, or parasites get out through a proctal aperture, causing an itch because of which dog, being scratched, extends parasites and eggs of an echinococcus not only round itself, but also on the wool even more. Contacting to such dog, the infection carrier can become and absolutely healthy well-groomed dog. At care of a dog or a cat, playing with them, insufficiently clean person transfers invasive materials on arms, clothes and further on house subjects through which any member of a family who are not contacting even not so can catch is close with animals. Herbivores in turn catch, eating a grass on pastures where sick dogs defecated. Beds to the grass, sheep transfer the eggs of helminth to their fur. Therefore, the person can catch at care of animals, their cleaning, a hairstyle or at cutting and meat processing. Children can catch, playing a grass or in a sandbox which the cat before has visited. Housewives, for example, can catch in the course of cooking, trying a crude mincemeat on salinity. Infection often occurs at insufficient heat treatment of meat. Also infection cases through fur products of a handicraft work are known - echinococcus eggs can remain long time on the fur with the incorrect working of skins. 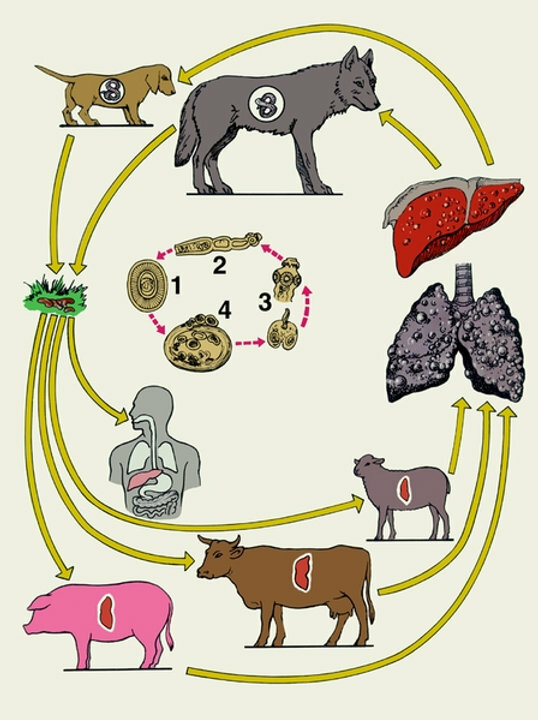 The infection of humans can occur, also, with the use into the food of vegetables, berries, fruits from the gardens and the vegetable-gardens, contaminated by feces of dogs, if these products were badly washed.In a variety of cases of infection epidemiological character is traced: cutting of hulks of animals, meat processing, processing of skins of animals, a hairstyle of sheep, fur manufacture, work as the shepherd, hunting, breeding dogs or cats and etc. One way or another, together with the food of the egg of echinococcus they fall into the digestive system of humans, where under the action of gastric juices their shells are dissolved and oncospheres are freed. With the aid of their hooks they separate the cells of mucosa of bowels and penetrate blood and lymph vessels. The immune system of healthy person is capable of killing thousands of oncospheres, but some one of them by blood flow or by lymph can be spread on entire organism, and settle in any organs. More often the liver - the first barrier on a diffusion way oncospheres a blood flow is surprised. Passed it oncospheres can settle in lungs, kidneys, a bladder, a lien, a brain. Are rare enough, but nevertheless chances of a lesion an echinococcosis of heart, eye orbits, pancreatic, a thyroid gland, tubular bones... In the history of medicine the case of an echinococcosis of a mammary gland has been described even. Heart - less than 1%. In the struck organ the helminth grows up a cyst with complex structure - a bubble with several types of covers in which the liquid with the new appeared bubbles and numerous scolexes contains. The sizes of a cyst can be from 1-5 sm in diameter to 15-20 sm with several litres of a liquid. The structure of this liquid includes various salts, amino acids, enzymes etc. The cyst usually grows in a human body and develops very slowly, from 1 year till 8 and more years. Mechanical pressure of such cyst leads to disturbance of functions of the struck organ and inflammatory processes. At rupture of the echinococcus bubble as a result of injury, injury, with the operation or the puncture occurs the sowing of the human organism and the development of plural cysts. If during the primary infection of men had weak immunity, plural echinococcosis immediately can develop. Illness also can develop cyst germination in the next organs and tissues, i.e. the echinococcosis can appear not only as dense roundish formation (a unicameral echinococcosis). Probably, for example, cyst germination by fine blisters from a liver in a diaphragm, lungs or kidneys (a multichamber echinococcosis). In typical, uncomplicated cases, illness develops almost asymptomatically in the long period - till 3-5 years, and sometimes and more. At this time the cyst slowly grows, being enlarged for a year by 1-3 cm and does not cause any inconveniences in the patient. In some years, at substantial growth, the cyst mechanically influences the struck organ, breaking his functioning. In this stage there are symptoms in the form of sudden giddinesses, a nausea, delicacies, dull aches and allergic reactions. The following stage already more expressed - appears objective symptomatology of a lesion of concrete organs of the patient. Mechanical rupture of a cyst is most dangerous. It can be caused falling of the patient, sharp movement, strong tussis by a jerk etc. or to occur spontaneously. Such rupture can be accompanied by allergy attacks, shock pains and lead to the serious consequences. Oncospheres of echinococcus are fairly stable. On the surface of the soil in the shade at a temperature of 10-26 ° C, they remain viable for about 1 month. At a temperature of 50 ° C oncosphere Echinococcus die within 1 hour at 60 ° C - 10 minutes, and at - 100 ° C - 20 seconds. The final home of echinococcus (dogs, and others) invaded them by eating animal organs, with blisters echinococcus containing scolexes. 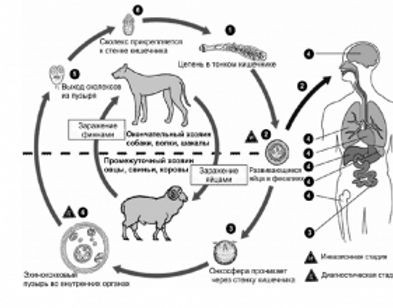 From each scolex in the intestine of the dog (wolf, jackal) develops sexually mature echinococcus. A person usually becomes infected through direct contact with animals, wool is contaminated with oncosphere. Certain important is a helminthes colonization of residential and outbuildings premises. Infection may also echinococcosis by eating raw vegetables from the gardens frequented by dogs. Horses, cattle, deer often become infected pastures. Wild carnivores (wolves etc) can also shatters oncosphere helminthes habitats and wild ruminants, so the possibility of infection last echinococcosis is not excluded.